Born in Nuremburg in 1961; trumpet. Birgit Ulher studied the visual arts and still maintains an active interest and engagement with this area working on drawings, environments and graphic works on polaroids. Since moving to Hamburg in 1982 her main interest has been in free improvisation and experimental music. At that time she co-founded a musicians collective and began working with various improvising groups. She has been organizing a festival for improvised music in Hamburg - Real Time Music Meeting - for about ten years. Since 1990 she has been working on a more personal musical language and extended techniques from which she has established a distinguished grammer beyond the open trumpet sound. 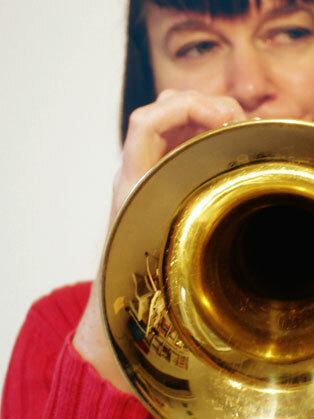 She works mainly on extending the sounding possiblities of the trumpet by using splitting sounds, multiphonics and granular sounds and has developed her own extended techniques and preparations for producing these sounds. Besides this material research she is especially interested in the relation between sound and silence. She performs solo, with dancers, working ensembles, and one-time collaborations with musicians from around the world. She has worked in Europe, the USA and the Middle East with, among others, Jürgen Morgenstern and Martin Klapper, the PUT-Trio (with Ulrich Phillipp and Roger Turner), the European Improvisation Orchestra (with Tim Hodgkinson, Martin Klapper, Albert Markos, Victor Nubla, Krzysztof Knittel, Raymond Strid, amongst others), 65 (with Dorothea Schürch, Marianne Schuppe, Hannah E. Hänni, Robyn Schulkowsky, Co Streiff, Stevie Wishart, Claudia Ulla Binder) and a duo with Ernst Thoma, live-electronics. She has played numerous concerts and tours throughout Europe and the USA with her working groups as well as in occasional/once-only groupings with many European and American improvisers such as Rhodri Davies, Söres Zsolt and John Edwards. 1995,	Humannoise Congress #7/#8/#9,	Humannoise Congress CD-R/booklet. 1996,	Air mail,	Hybrid HMP CD 13. Duo with Wolfgang Ritthoff. 1999,	Momentaufnahmen,	NURNICHTNUR 1001030. Klapper/Ulher/Morgenstern. 2000,	Umlaut,	NURNICHTNUR 100 04 25. PUT. 2003,	Slants,	UNIT UTR 4142. Ulher/Thoma. 2003,	Tidszon,	Creative sources CS 014. UNSK. 2004,	Landscape: recognizable,	Creative sources CS 037. Birgit Uhler/Lou Mallozzi/Michael Zerang. 2004,	Sputter,	Creative sources CS 042. Birgit Uhler/Gino Robair. 2004,	Sperrgut, Balance Point Acoustics bpa009. Birgit Ulher/Damon Smith/Martin Blume. 2005,	500gr,	Creative sources CS 052. Nordzucker. 2005,	Scatter,	Creative sources CS 054. Solo. 2006,	3:1,	Creative sources CS 110. Mazen Kerbaj/Birgit Uhler/Sharif Sehnaoui. 2007,	Doppelgänger,	Creative sources CS 103. Birgit Uhler/Ernesto Rodrigues/Carlos Santos. 2007,	Blinzeln,	Creative sources CS 155. Birgit Uhler/Heiner Metzger. 2007,	Radio silence no more,	Olof Bright OBCD22. Solo. 2008,	Blips and ifs,	Rastascan Records BRD 062. Duo with Gino Robair. 2008,	Yelept, Balance Point Acoustics bpa014. Birgit Ulher/Ariel Shibolet/Adi Snir/Roni Brenner/Michel Mayer/Damon Smith/Ofer Bymel. 2010,	Choices, Another timbre at41. Duo with Lucio Capece. 2010,	Hochdruckzone, Entr'acte 134. Solo. 2010,	Axon, Intonema int003. Myelin. 2011/2,	Stereo trumpet, Relative Pitch Records RPR1030. Birgit Ulher/Leonel Kaplan. 2012,	Radio tweet,	Creative sources CS 335. Ute Wassermann/Birgit Ulher.